When thinking of serious social problems that occur among young people, bullying is probably the first that comes to mind. A growing number of students are becoming victims of bullying in today’s society. This leads to depression and sometimes even leads students to consider extreme measures like suicide. The critical reason why adults have been unable to help students deal with the effects of bullying is because students feel like they have no one to rely on. They cannot find anyone to confide in and receive comfort from. Recently, an application called Holding Five was developed to help students who have been victims of bullying. 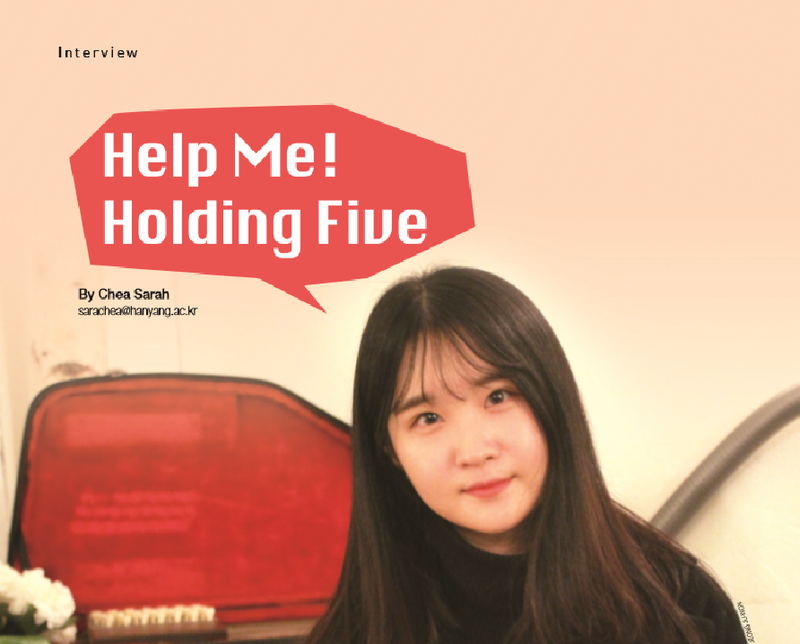 Holding Five is a small community where people from different walks of life can share their problems and find comfort in the fact that they are not alone. Kim Sung-bin, who was bullied in high school, is the creator of this application. Q. Are there any specific reasons behind why you decided to create the Holding Five application? A. Yes, there are. As a matter of fact, I was a victim of bullying when I was in my first year of high school. I was very depressed and had a hard time coping. During that time, what I desperately wanted was someone who listens to my stories and a place where I can share my feelings. In fact, I believe that no one can really imagine the pain caused by bullying unless they actually experience it. I wanted to do something meaningful for those suffering as I once did, and I wanted to be their friend when they are in need. For these reasons, I decided to create this application. Q. What did the people around you say when they first heard about your thoughts and plans for this kind of application? A. Reactions varied. Some people gave me positive feedback, while some had a negative attitude. Others were callously indifferent. Even my parents were opposed to my plan at first. Then, after a while, they started to acknowledge my efforts and passion for this plan. Q. When you first planned and started developing this application, were you confident about it? A. No, I was not that confident about it at the time. I also did not know that it would grow to the extent that it has. I just wanted to help people who were having a hard time. That was it. Q. Were there any obstacles before the application was finally launched? A. Of course, there were many. First of all, I did not have enough funds to operate such an application. When I first told my parents about this plan, I did not put much thought into financial constraints or the complicated process of launching an application. My parents, who obviously anticipated all these difficulties, did not consider my plan as a serious one. I requested an estimate for the application from an application company. The estimate was about $50,000. The company was willing to provide support of up to $30,000, but there was no way that my parents could finance the rest. I could not give up on this plan, so I searched online for a long time. Finally, I found an education company that provides financial support for good deeds. I sent a handwritten letter with my detailed plans to the president of that company. However, there was no reply for a long time. I doubted that my letter had even been delivered to him. I thought that my case was hopeless since I was just a student, and I decided to step back into reality. I kind of gave up and postponed it as a plan for the distant future. A. It can be explained separately through the words, “holding” and “five”. First of all, “holding” comes from a psychological term “holding effect,” which refers to the situation of a crying baby calming down when hugged or being shown some kind of physical affection. And “five” comes from a story I heard from my pastor. He told me about a man who was about to commit suicide, but decided not to after listening to a song on the radio. The song was 4 minutes and 59 seconds long. My pastor emphasized that five minutes during a crisis or medical emergency is crucial and is often referred to as the “golden time.” whereas it in our everyday lives is of little importance. Combining those two separated words into one, the overall concept of the name “Holding Five” is to comfort people as a mother would, especially when they are in that golden time period. Q. What kinds of issues are posted about in the application? A. Although I started this application targeting mostly high school students, many adults of different ages use it these days. The source of people’s troubles differs depending on their age group. For instance, teenagers mostly post about problems related to bullying, friendships, or their school lives. Adults’ problems usually concern their children who just have reached puberty. But I think this is great because teenagers can come to appreciate how their parents feel about them and parents can understand the feelings of students who are the same age as their children. Through the Holding Five application, people can learn about the true feelings of those whom they are having problem with, and this will help them better understand each other. Q. Seeing as you manage Holding Five, have you also changed because of it? If you have, in what way did you change? A. First of all, my self-esteem problems had been resolved. My biggest problem was that I did not love myself. I felt useless. However, through the processes of listening to others and encouraging them, I was naturally able to overcome this problem of mine. I became more confident and now love myself. Q. You recently published a book entitled Help me! Holding Five. Why did you decide to publish a book? A. I received an interview request from the JTBC News Room. At that time, a representative of a publishing company contacted me after listening to my interview on JTBC. Since my app is in the form of an open bulletin board where anyone can write anything, many stories are overlooked or not even read at all. He did not like that and suggested I publish a book containing all the stories, from beginning to end. I thought it was a good idea so I decided to publish the book. Q. In the book, you tell your story very truthfully. Was this hard for you? A. At first, it was. However, I realized that people would not know unless I tell them. By revealing my stories, I want students who find themselves in the same situation as I was in to know that there is an end to this difficult time. A lot of students contemplate suicide when they are bullied and feel like no one is on their side. But by listening to my stories, I wanted them to realize that there is hope in their situation. Q. What message do you have for students who are experiencing what you did? A. As I mentioned, I want them to know that there will be an end to their troubles. There is always a light at the end of a tunnel, even though it may be dark and seem as though it is unceasing. Likewise, to all the students who feel like their situations will never end unless they take extreme measures, I want to say that there surely is an end. More importantly, I want to tell them not to hide their stories and their sorrows. Be open about it and ask for help. There are more people than you may imagine who are willing to listen to your stories and be by your side. Q. Are you planning to continue managing Holding Five? If you are, for how long? A. I don't know for how long I will manage it because I am planning to do it indefinitely. I have not thought about its end yet, but what I really want is the normalization of similar programs. Although I have so many plans for these types of programs, it is hard to put them into motion because of financial constraints. This application will have to stop operating when donations run out. I hope that the Holding Five program can grow into a social corporation, if possible, so that its future is secure. A. I want to be a youth instructor. I want to be someone who can effectively communicate with students and listen to their stories.